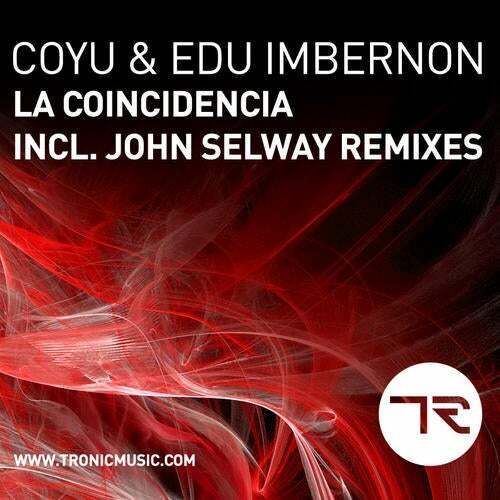 Having already scored hits on some of the most highly respected labels within the scene, Spanish pairing of Iván Ramos (Coyu) and Edu Imbernon are hotly tipped as future stars of tech house. Stand out releases for liebe*detail, Great Stuff and Diynamic have brought international acclaim to the duo and so it is with great pleasure that we introduce this release for Tronic. Arriving just in time for the European summer, La Coincidencia is a sultry but intense slice of percussive house music sure to move the floor with its ear-catching vocal snippets and heavy chugging bassline. John Selway makes a long-overdue return to Tronic via two remixes on this release. John's Mysterious remix toughens up the percussive Latin groove and adds in a good dose of atmosphere via a shimmering syth line and chopped up vocal loop. The Forward remix strips things back even more; taking the emphasis away from the tribal Latin feel of the original and bringing out the power of the drums and synth to create a more linear, heads-down groove for the more underground floors.